Washington (CNN) – Top White House adviser John Podesta defended the administration on criticism about its decision to swap Sgt. Bowe Bergdahl for five Taliban prisoners, the proposal to reduce carbon emissions by 30 percent and the mishandling of veterans health care. "The President will make tough decisions," Podesta told a group of reporters Friday at a breakfast organized by the Christian Science Monitor. On the Bergdahl case and the criticism leveled by Republicans and Democrats, you "just don't get the choice to say I am sorry I am going to wait until after November to bring one of our young soldiers home who has been captured by the Taliban…you have to make a decision right there." He emphasized Defense Secretary Chuck Hagel had approved the transfer of the five detainees demanded by the Taliban in exchange for Bergdahl. One of the major criticisms of the administration has been that these specific men – high-ranking Taliban members who are now living in Qatar – could try to return to the battlefield despite a travel ban, thereby posing a danger to the U.S again. 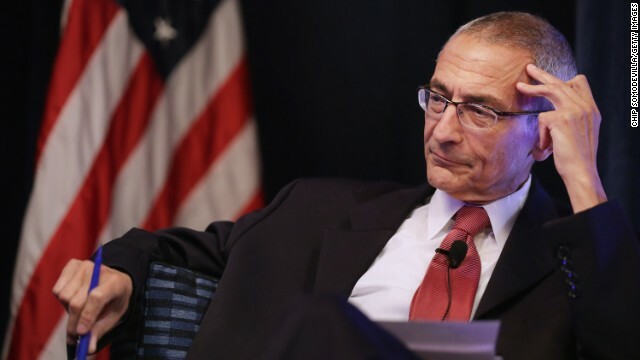 Besides assurances from the Qatari government, which brokered the deal, Podesta said the U.S. has "ways to monitor them" beyond that government to mitigate the threat posed by them. Asked if that meant independent monitoring of the detainees, Podesta wouldn't divulge details but said the U.S. has "a lot of ways…I think it is fair to say we will keep an eye on them." Another criticism has been the staging of the event last Saturday at the White House to champion the release which some have called a "victory lap." "He went out in the Rose Garden because it was important to explain to the American people" this was all about a human being and his captivity knowing the deal would be controversial, Podesta told the gathering. On the domestic front, the senior counselor to the President responded to criticism of the administration's proposal unveiled this week forcing current power plants to cut their carbon emissions by almost a third by 2030 because they are a major source of greenhouse gases since they are mostly coal-burning. The White House released a report Friday linking climate change to public health concerns as it tries to convince the American people why such a major change is needed and is increasingly using the health argument as a way to convince the American people the need for action. "Climate change will be increasing a problem for public health," Podesta told the group pointing out bad air worsens asthma, especially in children, which costs the government billions in dollars to treat. "I don't think the President thinks about it in those terms," Podesta said. The President thinks he has an "obligation to the American people" to make decisions to build better and cleaner futures for them. He said in red states, in blue states "there is very strong support" for action to deal with climate change but added "no doubt there are some states" where this initiative does "present political difficulty." Podesta then took a shot saying anyone who denies climate change "will have a very hard time" running in 2016. "If you are a climate denier" and going to run in 2016 "you will have a very hard road to toe." He didn't single anyone out by name, but Sen. Marco Rubio (R-Florida), who is considering running for President in 2016, recently told ABC News he doesn't believe human activity is causing climate change. podesta... the evil leftist puppetmaster of the clueless incompetent obama. very rare he shows his face. things must be going very poorly to call the puppetmaster out from behind the curtain. Nobody really pays ANY attention to the GOP CONSTANT RANT of criticism from these GOP CLOWNS that don't preform in congress and just continue to spew their usuall anti Obama BS. Guess what GOP morons , if he ran again he would beat your worthless do nothing GOP AGAIN!!!! I am sorry but did somebody asked for the ways those 5 guys will be monitored be divulged to the general public (which includes them as well)? Yeah I think I saw that SciFi movie. But the article is about reality. There is a real world out there with tough calls to make, and it just doesn't work out like a Disney movie. And the current administration is fighting a changing world of foreign and domestic terrorists. Obama hsa taken a measured even-handed approach and of course this is open to criticism form the "why don't you just _____________" arm chair quarter backs. This Week of Obama "Accomplishments"
1. Declared he wanted to shut down coal fired electrical plants so the price of electricy could sky rocket. 2. Released FIVE of the worse terrorist leaders from Gitmo. 3. Violated the law he said he would obey when he released them, even ticking off and spitting on his own party. 4. Lifted two pound weights in a "workout". 5. Bought a new pair of Mommy pants for the next 2.5 years of foreign policy work. @Just asking- This whole Bergdahl mess has just completely blown up in Obama`s face. The GOP and even a lot of Dems are hacked off about it. Its pretty bad when Feinstein is bent out of shape. Bringing out his puppetmaster and Harry Reid is all they can do but it won`t make a difference. The EPA has put the Coal-Tar Baby (ruling) out there. Those who spend the next four years punching it will immobilize themselves. Great timing. No need to put a scientifically correct cherry on top. This EPA ruling is unassailable as it stands. @This Week of Obama "Accomplishments"
A real shocker. Standard Operating Procedure for the White House is to lie and then just keep saying we are right. I guess we should just count ourselves lucky no soldiers have been charged with talking or audited by the IRS. @Beechman "...lucky no soldiers have been charged with talking or audited by the IRS." ding ding ding – new Conspiracy Theory of the day! Tomorrow it will be Fox News History. the bergdahl deal was the same one reported by the new York times and the haily paper 2 years ago. repos knew and senator mc cane was ok with it then. In fact numerous republican congressmen where bashing the president for not expediting his release.. Same 5 guys where named in the trade. Now the repos act like they never heard of it. It was no secret then and should not be a surprise now. All you trolls need to go back and look at the video and news print. Stop making everything a conspiracy . The army interview his platoon and now all of a sudden they have changed their tune. Makes you wonder how political this is. Gop a worthless party, with brain dead voters. Can anyone imagine if the President didn't rescue Berghald, got killed and his body dragged along Kabul town, what these know nothing, like Mika, Joe Scaborough, Fox News etc. etc. would have said? Am really tired hearing from folks who are empty headed like those I have mentioned already. Sorryy to say, they have no right to think they are there because their father worked on a high Office OR they happened to be voted in to work wth Congress, of which will never ever happen again. People have learnt about them. TOTALLY USELESS! They better go away. @smith1.... So you are saying TWO YEARS AGO, while Obama was ramping up the troop levels in Afghanistan and when fighting was in full swing, this imbecile wanted to give back FIVE top leaders to our enemy in exchange for what was then a private who was suspected of willingly walking away from his unit?!! THAT would have endangered every single US and NATO soldier in country. Had he done so, Obama would have and should have been impeached for aiding and assiting the enemy. Even now he has done that, but to a lesser degree, supposedly. If these guys show up back in Afghanistan while we are still there, I'm sure you will support Obama's impeachment right? Obama did right by bringing Bergdahl back to the USA. If the GOP stayed true to form like the last six and a half years the house would of denied Obama to bring the soldier back. They wanted no leaks because the Taliban not being stupid knew if Obama brought the trade to congress the GOP would of turned him down> Good for you Obama for making the trade and not leaving a soldier behind. GOP will spin this like ACA and fall flat on there faces give it time. The American people should ask the whereabouts of the 500 Talibans released by Bush. They are probably in knitting classes correct. So much for GOP support for soldiers. Where is all the news about ACA GOP that right people started to research for themselves and it works. It is just a matter of time until everyone reads through your BS. Yes Tony D we got the memo: Obama should be impeached if he does or does not bring the guy back. problem is two of those years democrats controlled all of the government and the other four years two thirds of the government and continue to block, obstruct and refuse to change their far left course, even after 5.5 years of record unemployment. you can only do so much when the democrats are hell bent on wrecking the country and economy and control the government. How about trying to defend the myth that Bergdahl was a hero who was captured by the Taliban? That was the myth that Obama was personally trying to sell as well as Rice was trying to sell. It was nothing but a HOAX! Unfortunately, Bush was allowed to return to the battle field in 2004. And the end result was a housing crisis, an inflated national debt, a broken stock market and a Great recession to go along with thousands of dead American troops and 9/11 aftermaths. If science can't say they are 100% certain then a mob of determined "believers" can't say it to our children. It has nothing to do with bringing the guy back. It has to do with giving our enemies and people that are currently engaged in open warfare with, FIVE of their top leaders. Would Roosevelt have exchanged a captured Rommel for a captured US private in 1942? Of course not, that would have been insane. Yet Obama was considering exchanging FIVE general level enemy prisoners?!! Total insanity AND impeachable. what difference does it make if Bergdahl was a hero or not. Are you saying we should leave a solider behind if he doesn't agree with you?? I guess you are smarter than the US military. What is wrong with this country that we are condemning this guy before he has a chance to defend himself. ?? you should all be ashamed.